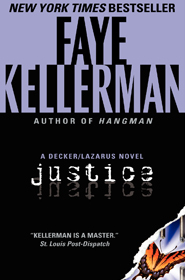 JUSTICE, number eight in the series of Decker and Rina, was written in a very different way. Told in first person by the teenaged protagonist, Terry McLaughlin, and in my traditional third person through Decker’s point of view, the story features a homicide in a hotel room that occurred in an after-prom party. The center suspect is a charming but pathologically disturbed teenager who matches Decker not only in height but in wile.